Local Trust - What’s next for public services? What’s next for public services? Since the financial crisis, there has been no shortage of critiques of the state of UK public services and the challenges they face in terms of decreasing trust in government, increasing demands on services and reduced budgets. Many commentators, politicians and public servants have spoken about the need to change our model of public services. The work of the Carnegie UK Trust on the enabling state brings these trends together and argues that this represents a paradigm shift. It doesn’t mean we stop the state from delivering public services, it delivers some very well and for some services like policing and certain aspects of social work, the state is the only potential actor. But for other services, especially local and personal services, there is an increasing awareness that we need to bring people and communities to the centre of our model of working as active partners, not passive recipients. What do the public think? When we polled the general public in early 2015 we found that over half (55%) felt that they had too little control over public services. This was true regardless of social class or geography. When we asked people whether they felt that they had more or less control over how public services are designed and delivered in their area over the last five years most people said that this had remained unchanged (61%) or that they had less control (29%). This is interesting given UK government policies such as the Localism Act in England and Wales which have in theory offered individuals and communities a more active role in public services and decision making. So the challenge for the UK government is to explore how they can turn the rhetoric on localism, engagement and enabling government into a reality for people. What does an enabling approach look like in practice? Our Route Map to an Enabling State (summarised in the picture above) sets out 8 steps that governments can take to facilitate these things whilst ensuring that the same disadvantaged groups don’t get left behind again. 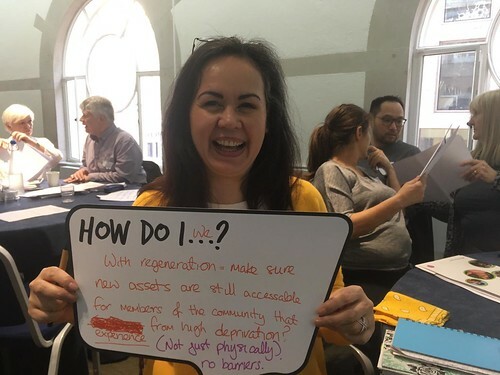 The steps are broadly a combination of creating space and providing tools and support, without strings attached, in order to empower people to take a more active part in public services and decision-making. And we know from our evidence gathering that this is already happening. Earlier this year we launched the Enabling State Challenge to showcase and celebrate organisations who are already putting some of these steps into action. We received over 120 entries from different organisations right across the UK and our 6 finalists have been selected as great innovative examples of an enabling approach being applied in practice from whom others can learn. The question now is, who else will take on the challenge to make enabling the new reality for public services?